® on all distal hemimusculature: extensor and abductor muscles of the superior and inferior limbs of a single side. Except this systematisation, speaking of postural syndrome is not safe. To keep the conventional ENT language, the postural syndrome is said harmonious if the axial hypertonicity is on the opposite side of the distal hypertonicity, and the syndrome is said disharmonious if the axial and distal hypertonicity are on the same side. Among monkeys, these postural syndromes appear following brainstem stereotaxic lesions affecting structures involved in the regulation of the tonic postural activity (Uemura and Cohen, 1973). 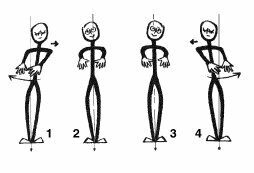 We think that among human beings these same postural syndromes show that equivalent structures are suffering (Vedrenne, 1975). These preliminary remarks should allow to better understand the limits of clinical posturology and in particular to clearly distinguish it from studies of other tone disorders as "pyramidal", " extrapyramidal " or " spastic like " hypertonicities. harmonious postural syndrome: the left axial muscles and the right dista1 muscles (extensors and abductors) are hypertonic; the hypertony is crossed. disharmonious postural syndrome: the left, axial muscles and the left distal muscles (extensors and abductors) are hypertonic; the hypertony is not crossed. Without this systematisation speaking of postural syndrome is not safe. Pure postural semiology and related semiology. Postural hypertonicity is better noticed clinically when it prevents postural reflexes from going on: Romberg postural reaction, oculomotor postural reaction, neck reflexes, labyrinthine postural reflexes, then it is on its own ground that one judges some disorder of the tonic postural activity. We shall widely extend over this semiology, privileged, purely postural. One can also directly palpate under the skin the relative tone of the sub-occipital muscles and of muscles from vertebral grooves. The precautions of this exam are known (Maigne, 1973). With a little training, the fact that here or there is hypertonicity appears as certain as an experiment fact. But this hypertonicity is palpated outside any postural context, therefore a doubt remains on its semiological value: is it or isnât it postural hypertonicity? For the present time, we have no other criteria than the coherence inside a postural syndrome of this hypertonicity. Semiology of oculomotor imbalance is well known (Hugonnier, 1959). As eye horizontal movements are those the impact of which on tonic postural activity was the best studied, we simplify results of the orthoptic examination by paying attention only to this horizontal component to judge the relation of the observed oculomotor imbalance with a postural syndrome. In this way, limitation of convergence movement of one eye constitutes a good summary of the orthoptic examination, but not its exemption. á the position of subjectâs head with regard to fixed marks. One asks then the subject, to close both eyes and to stay so in balance, blindly, during about 15 seconds. Then the observer notes, among postural sway, the average movement of the head and the indexes of the subject. The manoeuvre is made again, a second time. Figure 2: Rombergâs Postural Reaction. 3 & 2: The eyes are open: notice that the bipupillary axis can be tilted towards the right (2), or towards the left (3). Then if the subject is made to close his eyes what can be observed is. Either a leftward translation and/or a rightward rotation if the bipupillary axis was tilted towards the right. Or a rightward translation and/or a leftward rotation if the bipupillary axis was, tilted towards the left. The subject the bipupillary axis of which slopes to his right side normally presents a deviation of his body axis towards his left side and\or a rotation around his vertical axis bringing about a movement of his indexes towards his right side. The subject the bipupillary axis of which slopes to his left side normally presents a deviation of his body axis towards his right side and\or a rotation around his vertical axis bringing about a movement of his indexes towards his left side (Dasse, on 1975; Gagey, 1973b; 1974a; 1977d). The subject stands upright, quiet, feet close together; he looks straight ahead. The observer props his head, looks for a rigorous axis of aim and notes the position of the subjectâs head with regard to fixed marks, then asks the subject to turn his eyes on his right-hand side for ten or fifteen seconds, then to turn eyes to the left during about fifteen seconds. 2 : The feet are close together, the, eyes are looking straight ahead: the starting position. 3 : When the subject is asked to keep his eyes turned to his right side, a leftward translation can normally be observed. 1 : When the subject is asked to keep his eyes turned to his left side, a rightward translation can normally be observed. Normally one observes a translation towards the left of the axis of the body when the subject turns eyes to the right, and conversely (Baron. On 1973; Dasse, on 1975; Gagey, 1974a). (See figure 3). The subject, seated, stretches his arms horizontally in front of him, fists closed except indexes, stretched out, which face each other. Blindly, the subject makes some scissors like movements with his upper limbs, then stops when his indexes are as exactly as possible at the same level, facing each other. The manoeuvre is repeated several times, at first head at rest, then rotated to the right and then to the left. Figure 4: de Cyonâs test. 1 but when he keeps his head turned to his right side he puts his right finger systematically higher than his left one. Rotating the head brings about a position systematically higher of the index on the side where points the chin. (Cyon, on 1911; Dasse, on 1975; Gagey, 1974a; Marchal-Fabin, on 1977; Dirty, on 1974). (See figure 4). Fukuda's stepping test, for lower limbs. The subject stands upright in the centre of the Fukudaâs ring, blindfold, his arms stretched out horizontally in front of him; he is invited to step on the spot, 50 time, raising his knees high. The manoeuvre is repeated, head at rest, then rotated to the right, then to the left. Figure 5: Fukuda stepping test. 2	with his head straight ahead, a normal subject when he marks time does not go out of the hatched area. 3	But with his head turned to the right he deviates leftwards. 1. With his head turned to the left, he deviates rightwards. (Notice that each diameter makes an angle of thirty degrees with the next one. The subject makes fifty steps each time). Head at rest, a normal subject does not go out of the 60¡ quadrant situated just in front of him, he deviates to the left when his head is rotated to his right and vice versa (Dasse, on 1975; Fukuda, on 1959; Gagey, 1974a; Ushio, on 1977). 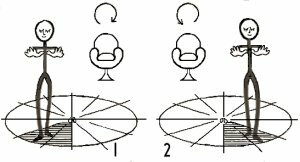 The subject is rotated on a Barany chair, extremely slowly (two tours in ten seconds), before making a Fukudaâs stepping test. 1. After a mild clockwise rotation on a Barany chair (two rotations in ten seconds) a normal subject deviates to his right side during a stepping test. 2. After a mild anticlockwise rotation on a Barany chair (two rotations in ten seconds) a normal subject deviates, to his left side during a stepping test. After a clockwise rotation, the subject deviates to his right-hand side, and after an anticlockwise rotation to his left. (Dasse, on 1975; Fukuda, on 1961; Gagey, 1974a). (See figure 6). The tests we have just described constitute the main part of the clinical postural exam which can be possibly completed by the Test of the key (Gagey, 1974b), the research for the sign of the movement of feet (Gagey, 1973a; on 1975), the definition of his "eye of verticality" (Dasse, on 1975; Gagey, 1974a), the measure of the pelvis rotation (Gagey, 1974a; on 1977). But we shall not describe these tests here because they are not of regular use in clinical posturology. Posturology, for a long time, remained in laboratories after the works of Magnus and de Kleyn; now, thanks to the support of posturographic recordings (Gagey, 1973b) it enter the daily clinical practice. Certainly clinical posturology is still being made, but already it appears of a big wealth and its sharpness, which can seem puzzling at first sight, do not take it on the sharpness of any clinical examination. It is situated at the limits between observation and neurophysiological reflection, what appears to us a nice and secure epistemological position. Baron J.B., Bessineton J.C., Bizzo G., Noto R., Tivanian G. & Pacifici M. (1973). Corrélation entre le fonctionnement des systèmes sensori-motrices labyrinthique et oculomoteur, ajustant les déplacements du centre de gravité du corps de l'homme en orthostatisme. Agressologie, 14, B :,79-86. Cyon E. de (1911). L'oreille, organe d'orientation dans le temps et dans l'espace. Alcan, Paris. Dasse. JX (1975). Intérêt de l'examen postural clinique et instrumental dans la réparation des dommages corporels. Mémoire pour le C.E.S. de réparation des dommages corporels. Paris. Fukuda T, (1959). The stepping test, Two phases of the labyrinthine reflex. Acta Oto-Laryng. (Stockh. ), 50, 2 : :95-108. Fukuda T. (1961).Studies on human dynamic postures from. the view point of postural reflexes. Acta Oto-Laryng. (Stockh. ), Suppl. 161. Gagey P.M., Baron J.B., Lespargot J. & Poli J.P. (1973 a) Variations de l'activité tonique posturale et activité des, muscles oculocéphalogyres en cathédrostatisme. Agressologie, 14, B : 87-96. Gagey PM. (1973 b). Examen clinique postural et posturographie. Revue de Médecine du Travail, 2, 2 : 237-241. Gagey P.M. (1974 a). L'examen clinique postural. Communication à la Société de Posturographie, Séance du 20-11.1974. Gagey P.M., Baron J.B. & Ushio, N. (1974 b) Activité tonique posturale et activité gestuelle. Le test de la clé. Agressologie, 6. (15) 5 : 353-358. Gagey P.M., Baron J.M., Amphoux M., Blaizot M., Gentaz R., Gournot H. (1976). Perturbations de lâactivité tonique posturale des membres inférieurs en : cathédrostatisme au cours des mouvements oculaires horizontaux rencontrées dans certains syndromes post-commotionnels d'origine tronculaire. Agressologie, 16, D : 77-82. 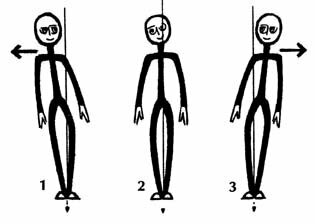 Gagey P.M., Asselain B., Ushio N., Baron J.B. (1977) Les asymétries de la posture orthostatique sont-elles aléatoire. Agressologie, 18. 5 : 277-283. Hugonnier. (1959). Strabismes, hétérophories, paralysies oculomotrices. Masson, Paris. Marchal-Fabin C. (1977) Les troubles de lâéquilibre dans les professions du bâtiment. Thèse de Médecine, Paris Val-de-Marne. Paillard J., Brouchon M. (1974). A proprioceptive contribution to the spatial encoding of position cues for ballistic movements. Brain Res., 71 273-284. Uemura T.. Cohen B. (1973). Effects of vestibular nuclei lesions on vestibuto-ocular reflexes and posture in Monkeys. Acta Oto-Laryng. (Stockh. ), Suppl, 315.